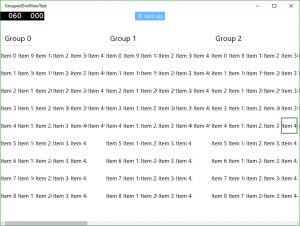 Time for more work on getting our LOB app converted to an UWP. First thing we needed to do in order to get everything to work again was adding the various build configurations again. When migrating the projects, these were lost. (I had to add them anyways to the new PCL’s, which were created from scratch). I’ve tried a few things, such as different versions of automapper. With V4.0.4, the latest, it didn’t work. I then reverted to the version we were using before the upgrade (3.3.0), no dice. Got a suggestion from the BartMan to try 3.3.1, and this seems to work just fine. At last, time to fix all the xaml! I’m writing down some of the more generic issues here. It seems like the default orientation of the GridView element was changed from vertical to horizontal. This can easily be fixed by changing its ItemsPanel. Luckily we already use a base style for this element throughout our application, so all I had to do was change this style. Another thing with the GridView: its items suddenly have a default Margin of 0. On another page where we use a GridView, the impact was bigger. We have a GridView that uses grouping, but for some reason the items were stacked vertically and weren’t wrapping. It took a few tries and a lot of cursing to get the original behaviour again. In essence, you need to set the outer ItemsPanel to an horizontally orientated ItemsWrapGrid (or equivalent), the GroupStyle.Panel to a vertically orientated one. We decided not to change this for our application. But, because this bar is 25px high; we had to adjust our header to its new position. I’m gonna wrap this post up with this, I’ll come back when I stumble on other things that have (drastically) changed from W8.1.